Jo Maria, the owner of this business is originally from Rio, but her husband’s family is from Paraty. She and her family live outside the Historic District in a farmhouse. The store was originally the courtyard of a building that was built in the mid 1700s. Jo Maria’s husband’s family lived in the home for nearly 50 years. They converted the courtyard into a store by constructing a roof and linoleum floors and keeping the area open to the outdoors for ventilation. Jo Maria hires local people and has installed energy efficient fluorescent lighting that she uses only at night. She uses fans instead of air conditioning. 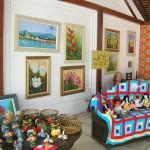 She uses materials from the local area to create her own patchwork designs and oil paints. Check her website to see many of her beautiful traditional patchwork patterns!